Disney's studio has always been famous for the ability to find a common language with its target audience - with families, but recently something went wrong, because every new studio film (if it's not a new part of the next franchise) is a complete disappointment. Disney bosses in the pursuit of profit put not on those projects, and, as a result, failure after failure, so that the number of new films shot according to original scenarios or being screen versions of books, becomes less. I do not know what the goals were pursued by the notorious Disney bosses when they took on the adaptation of the little-known books by Madeleine L'Engle, but the new film on the first part of the cycle can not be called success. For a long time already a fantastic and bright fantasy did not cause such wild boredom, as it happened with the "Breaking of Time". This is an openly weak film that demonstrates how much Disney's studio has passed its position in the field of family cinema. I do not know if the original source of the script is at fault, but the story turned out to be so confused and difficult to digest that it's difficult not only for children but also for adults to sit out until the end of the film. This is the case when a beautiful picture does not completely compensate for the lack of a sane script. The first thing you want to scold the creators of the picture is that with what seriousness they carry pseudoscientific nonsense to the masses. Here we have the parents of the main heroine, dear physicists, who repeat some kind of heresy about love-charged particles on different ends of the universe that can be attracted to each other ... by the power of this love. I might have misunderstood something, but it sounded like that. And then we rub a simplified version of string theory, according to which the universe can travel without any spaceships and spacesuits, just as you click your fingers. And all this pseudo-scientific nonsense, of course, must be confirmed by the appearance of three eccentric ladies who are able to fold time and space at will. If everything happened because of the magic, it would be much less offensive than when we weave physics and try to cover up its laws by unsuccessful, it's worth emphasizing, all the krabli-crabs that occur on the screen. This also includes some kind of absolute evil, unraveling its tentacles throughout the universe. Evil is so incomprehensible that it seems that even the script writers could not comprehend it and outlined schematically that in the plot there was at least some antagonist. The second weak component of the "Break of Time" - the characters. With the exception of the young Deris McCabe and the magnificent Reese Witherspoon, one can not even mention an actor's game. Chris Pine is trying to squeeze something out of himself, but his history is not enough, and there is nothing special to play. Storm Reid and Levi Miller, apparently, are still too inexperienced, so all the attention to themselves is drawn by more eminent stars. And the "Time Fracture" is an example of reverse racial discrimination, when black actors are shoved literally into all the central roles, singling out only a few roles to "whites". Maybe it's a black director, or maybe it was the writer's vision, but there are too many black actors. 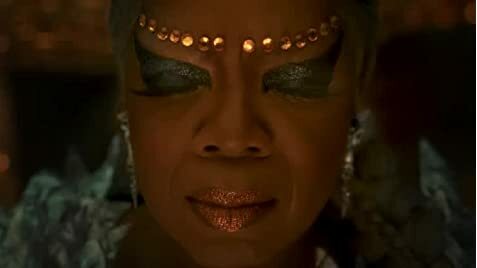 Even if you quickly assess Meg Murry's surroundings at school, then virtually all of her offenders are "black" or Latino, the director is "black," she herself, her mother and brother are also, even two of the three cosmic entities - "colored". But the "white" can be counted on the fingers of one hand. And I would not say that it somehow touches me, but when the viewer is literally jabbed by the racial diversity, which is attracted to the ears, and political correctness - this causes only rejection and perplexity. A "Time Fracture" is not a "Black Panther", the "black" cast of which is conditioned by the plot. The third point that upset me was the everywhere hanging guns on the walls, which did not fire when they were supposed to shoot. The film asked a bunch of questions, the answers to which the viewer has not received, and is unlikely to receive. What discovery did Alexander Murri, that the universe so appreciates? How did he move? Why is Charles Wallace so clever and how does he know the three Mrs.? Why did Shadow become interested in the boy? How to understand the ending with obsession? There are so many questions after viewing that it seems as if you looked not a two-hour film, but separate episodes of the series, between which there should be more scenes that would explain everything. But they are not. And it would be very annoying if the film caused a little interest. But he is so sluggish and refined that you follow the final drama without much enthusiasm and without looking at the clock. Of the pros, I can distinguish except that the work of costumers, an excellent visual series and beautiful landscapes of other planets. But in the century of ubiquitous computer graphics in the cinema, it is already difficult to surprise such people, but perhaps a qualitative scenario is possible. "Break of time", alas, it was not possible. Children to watch the twists and turns of the story will be boring, and adults have nothing to watch at all. Thus, the film is unlikely to find its target audience and will sink in oblivion after many other original Disney films of recent years. Reese Witherspoon and Chris Pine appeared in This Means War (2012). Calvin: I think I'm going to go home! Calvin: Yeah! There's some things I need to say to my dad. Maybe now I can finally say them. It's funny how it took a trip around the universe to get me there. The Walt Disney Pictures logo is affected by a tesseract.